Rooftops in New York City are an underutilized space and represent critical opportunities for improving social life and ecological habitat in our dense city. Please join us on June 7th at The New School for the 1st Annual Conference of the NYC Green Roof Researchers Alliance to hear, respond, and interact with the latest research on the science, education, and policy of green roofs in NYC. The Green Roof Researchers Alliance (GRRA) is a consortium of over 50 researchers, educators, and policy makers from 17 different institutions both in the city and New York state. Coordinated by NYC Audubon with funding from the New York Community Trust, The GRRA is studying the benefits and potential of green roofs, working on policy, creating curriculum, and working to improve and expand green roofs in NYC. 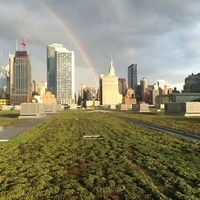 The GRRA is synthesizing knowledge and needs for advancing green roof investments as part of improving sustainability, resilience, biodiversity and social equity in access to urban nature for all New Yorkers.